Set on Mosque Street in the heart of Chinatown, you’ll sleep plenty of winks at the aptly named and uber-comfortable pod-hostel, Wink Hostel. 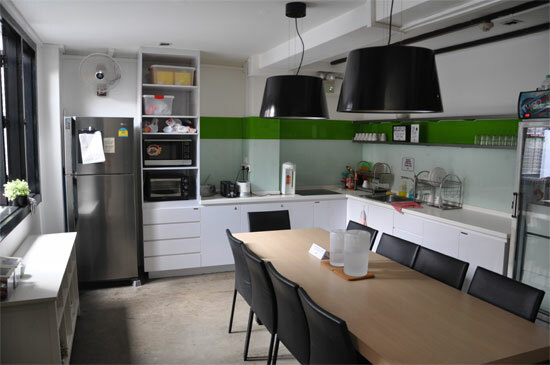 Wink is one of a growing clutch of upmarket pod hostels in Singapore, where instead of a bunk-bed you get a “pod” — effectively a spacious tube among several stacked in rows. In our case we had a single pod (or capsule) in a six-pod dorm. 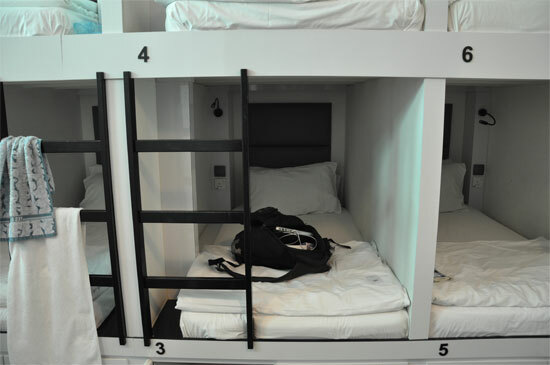 Singapore hostels often have a tendency to cram bunks into every space large enough to fit a pillow. Not so at Wink, where there is plenty of open space — in our dormitory there was enough room to fit at least two more sets of bunks, but instead there was a single lounge. 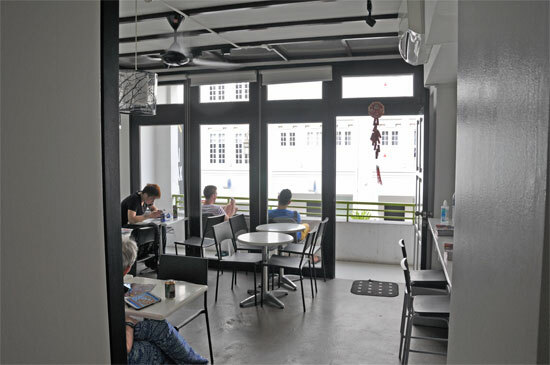 Throughout the hostel nooks and crannies invite you to put your feet up: relax in the “cafe”, which includes a veranda overlooking Mosque Street, hang out at the spacious and well kitted out kitchen or just make use of one of the internet terminals scattered around the place. Each pod capsule comes with its own plug and reading light and, in a very clever touch other hostels would be smart to adopt, when you enter the room with your security card, the light in your pod automatically switches on, negating the need to turn on the bigger light, perhaps disturbing others in the room. Bedding is comfortable and the WiFi signal strong. The capsules each have a deep luggage storage area below the bed. It’s keycard protected and is plenty big enough to store both a full-size pack and a daypack. Queen-size pods are available for couples. Bathrooms and showers are on the upper floor, which, as was the case with us, means it is a trudge upstairs to reach them. There is a toilet on the lower floor, but no showers. They are separated for the boys and girls and are spacious and extremely clean. Again, other hostels cram their bathrooms into half the size they have done here. With its many gathering areas — cafe, kitchen, lounges — there are plenty of possibilities here for single travellers to meet others and it’s a fairly sociable place. It might be a bit more sociable still were their beers not so overpriced — ouch! Kitted out dining area and kitchen. While the ground floor entrance is not keycard protected, your dorm and your locker are. Take care with your key. They are flimsy and we’ve broken ours (and lost the deposit) in the past. Broken keys aside, we found the staff here to be very helpful — they were able to supply concise and detailed advice for locations we wanted to find and at all times were friendly and accommodating — one even commiserated that their beer was very expensive. Internet terminals are dotted around the place. The location is obviously good for Chinatown and as Mosque Street is very quiet you’ll get next to no traffic noise in the evening. Some good Szechuan eating is on offer a couple of doors up and the hostel is extremely close to Chinatown SMRT. Wink is in the same price range as Pod Boutique Hotel and we felt of the two, this was the better value, though Pod Boutique does have a more sophisticated air about it. Another fine option is Adler on South Bridge Road. Yet another is Chic Otel a few doors up -- we were unable to see a pod here, but were told each has its own TV. Last updated on 2nd August, 2016. Check rates at Wink Hostel on Booking.com. Price for single pod. S$90 for double. 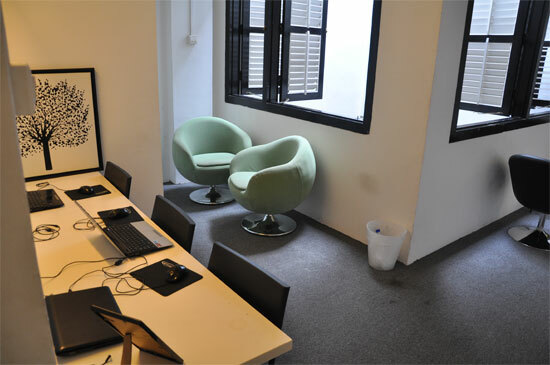 Room: Dorm air-con, low season: S$50, high season S$50. Notes: Price for single pod. S$90 for double.